A site dedicated to the new Audi Q7. Rugged, sporty, high-end: the Audi Q7. Not for the first time, Audi establishes a new class of vehicle - with the Audi Q7, the third generation premium SUV. The Q7 combines the qualities of a classic sport utility vehicle(SUV) - robust design, high seating position, off-road capability, functionality - with the uncompromising standards of the Audi marque; greater driving dynamics, more space plus enchanced luxury and comfort...all in the 2006 Audi Q7. 2003 witnessed the unveiling of the Pikes Peak quattro concept study, a thoroughly Audi take on sport utility. Featuring a 500 hp V8 with race-bred FSI® direct injection technology, Pikes Peak quattro offered the world a first look at the future of the SUV as envisioned by Audi's stellar design team. The Pikes Peak will be seen in production as the Audi Q7. 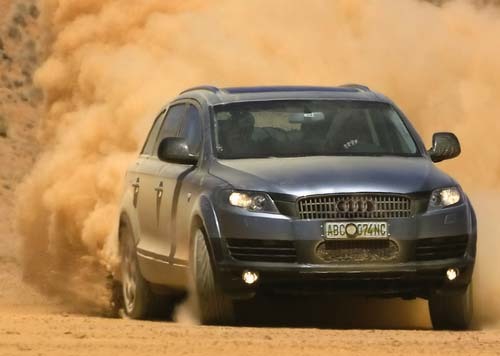 The new Audi sport utility vehicle (SUV) will bear the name Q7 when it goes on sale in 2006. This announcement was made at the Paris Motor Show by Prof. Dr. Martin Winterkorn, Chairman of the Board of Management of AUDI AG. "The letter Q denotes a new type family within our company, alongside A, S and RS. The 7 indicates that it is positioned between the A6 and A8," explained Prof. Winterkorn. 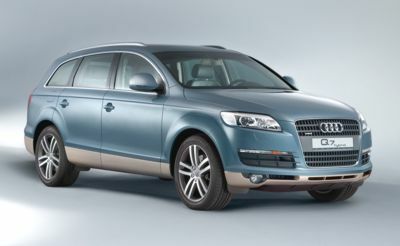 The Q7 will make its market debut at the start of 2006. The production version will be based on the Pikes Peak quattro concept study unveiled at the 2003 Detroit Motor Show. In common with the study, the five-door, seven-seater Q7 will combine the qualities of a fully-fledged off-road vehicle with the typical dynamism of an Audi high-performance sports saloon. The Audi SUV will moreover offer cabin space that sets new standards in its class.